We starting our week with a casual take on 'all white' outfits. Here are some of our looks we created to take your inspiration from. First look is very laid back and paired with a little bit of a colour (baby blue - that's one of our favourite colours at the moment). Pair of jeans and a t-shirt, simple make up and you ready to go and browse the shops for the day. 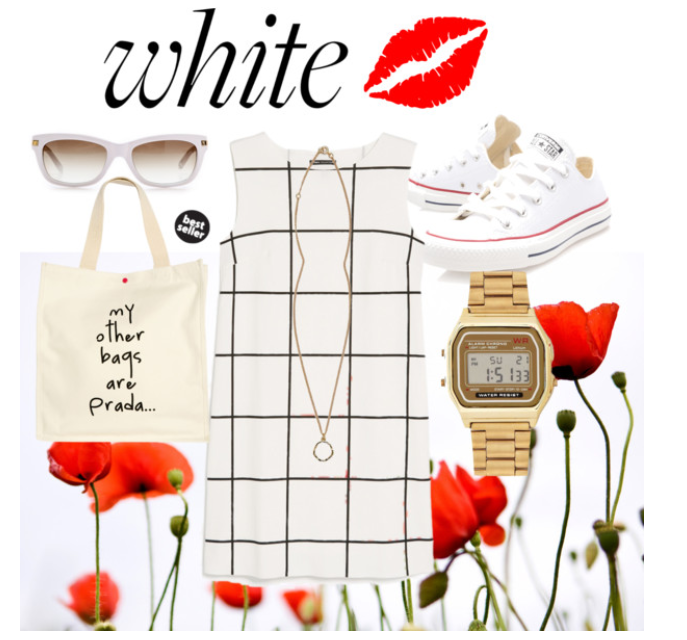 For our second look we picked this super cute day dress (I know it's actually black&white, but I just love the print and shape of this dress), simple accessories like this retro watch and pair of converse to keep you comfortable for a lunch with the girls. And our third and the last look is a summery combo of shorts, crop top and comfy sandals. Add some interesting accessories like the crochet fringed bag and pop some colour with statement necklace and red lippy. And you ready to impress your date. What are you thoughts on wearing all white in your casual look? Would you pick any of these?